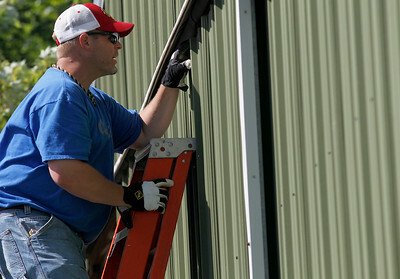 Matthew Apgar - mapgar@shawmedia.com Tim Maynard tries to fix a sliding door on one of the buildings at the McHenry County Fairgrounds as he and other workers tend to the grounds on Friday, June 19, 2015 in preparation for the upcoming August fair in Woodstock. 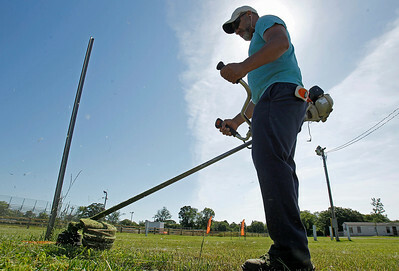 Matthew Apgar - mapgar@shawmedia.com Juan Lopez uses a trimmer to cut the grass around objects too difficult to reach with a lawnmower as he and other workers tend to the grounds on Friday, June 19, 2015 in preparation for the upcoming August fair in Woodstock. 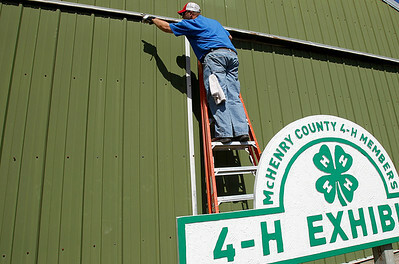 Matthew Apgar - mapgar@shawmedia.com Tara Parks gives fences a fresh new coat of white paint as she and other workers tend to the grounds on Friday, June 19, 2015 in preparation for the upcoming August fair at McHenry County Fairgrounds in Woodstock. Matthew Apgar - mapgar@shawmedia.com McHenry County Fair board President Ken Bauman poses for a headshot on Friday, June 19, 2015 at McHenry County Fairgrounds in Woodstock. 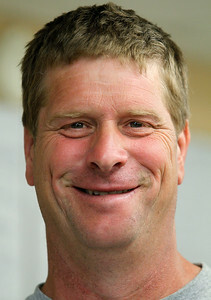 McHenry County Fair board President Ken Bauman poses for a headshot on Friday, June 19, 2015 at McHenry County Fairgrounds in Woodstock.